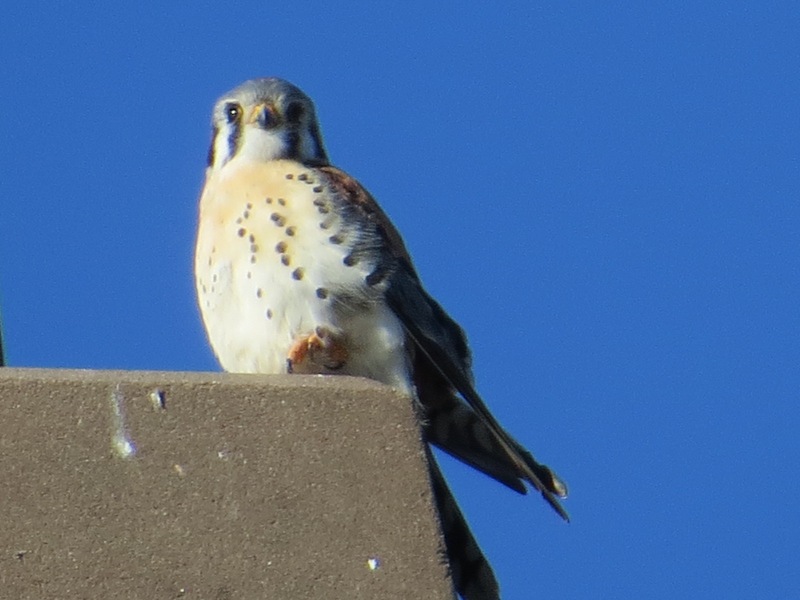 This was the first sign of a female Kestrel in the neighborhood. I first saw her January 13th. 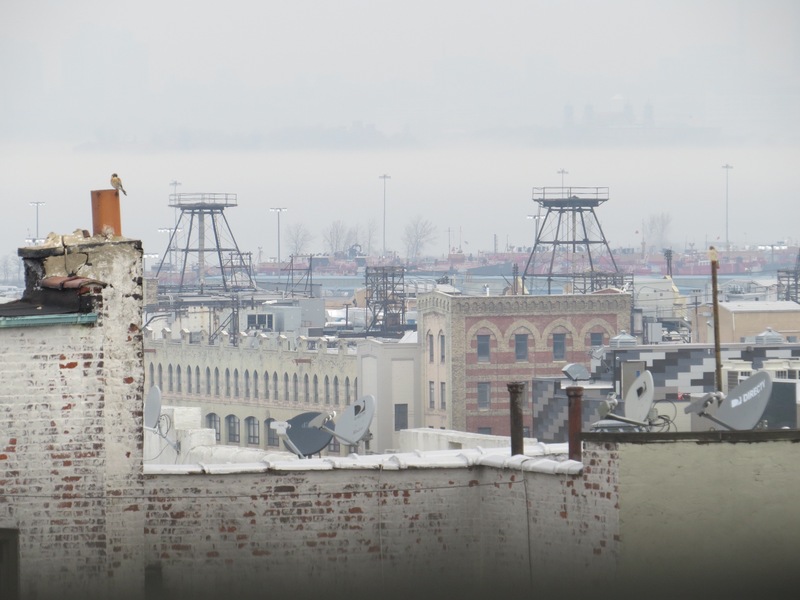 I’d been seeing males in Green-Wood, on Sunset Park High School, and on the 40th Street antenna, an elaborate, two-pronged structure used by a car service, since December. This is the second of three sightings of a male on the edge of Sunset Park High School. There’s a good view of Green-Wood Cemetery’s 4th Avenue extension from up there. This picture is also on the 13th, taken perhaps ten minutes earlier than the first shot. 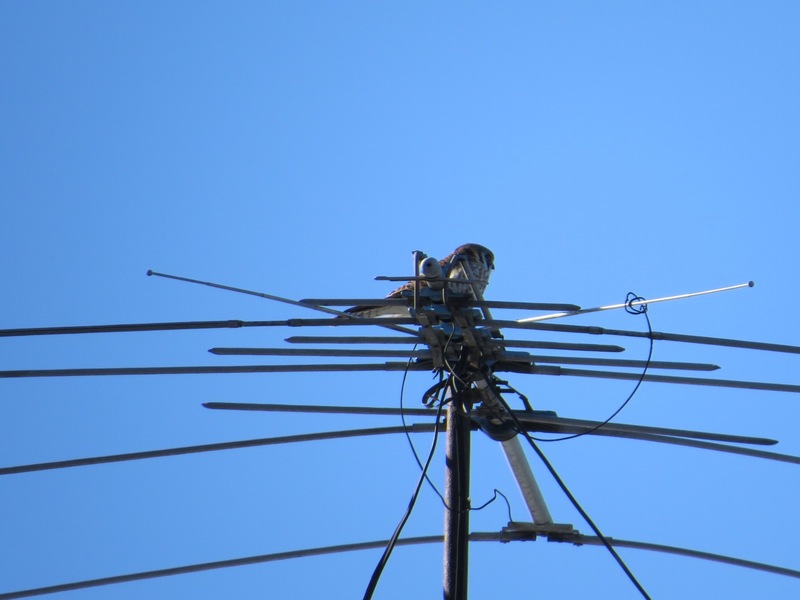 I know there’s at least one other male in the hood, but I’m not sure which one mated with a female on the antenna on 1/23. Meanwhile: Yesterday, I saw another quick bout of mating. Female on the pipe on the right is hard to see. 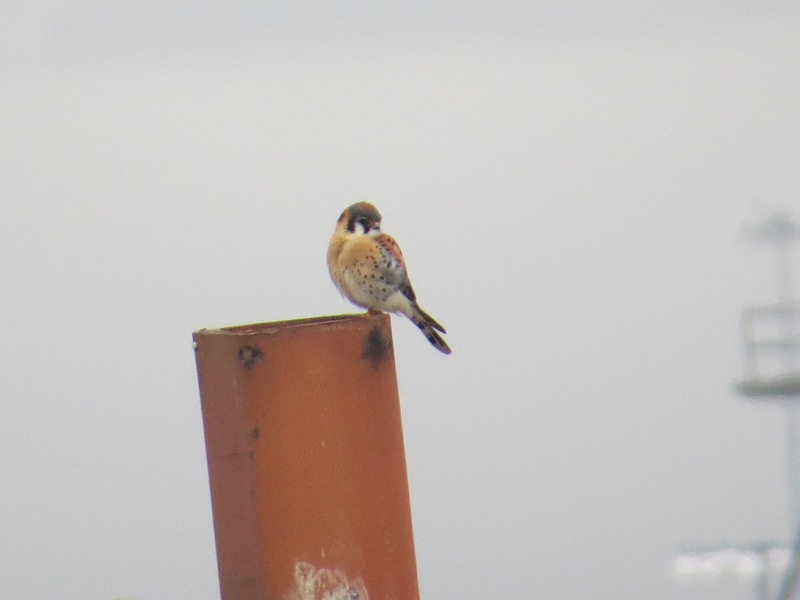 Male on the chimney pot on the left. These pictures were post-. 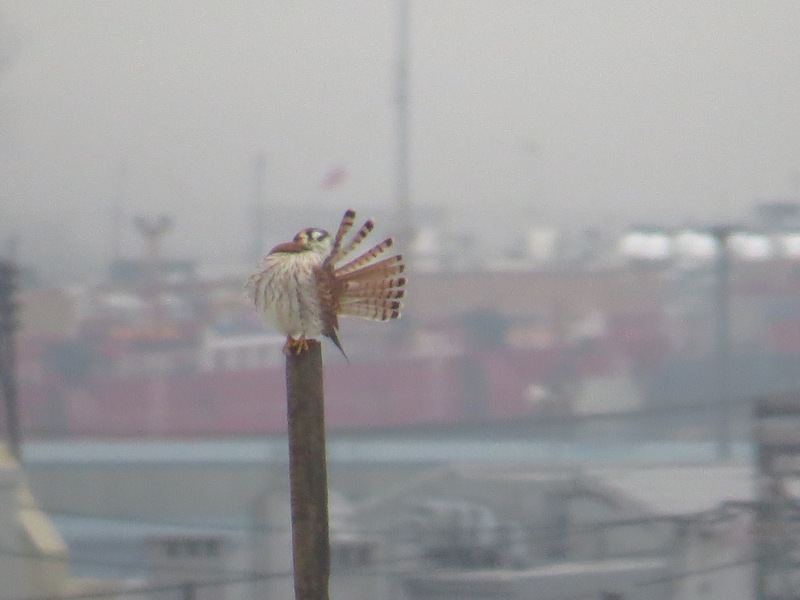 The female is very streaky in front, not spotty, and doesn’t have the tawny-brick-orange bib of the male. This female really likes this pipe. 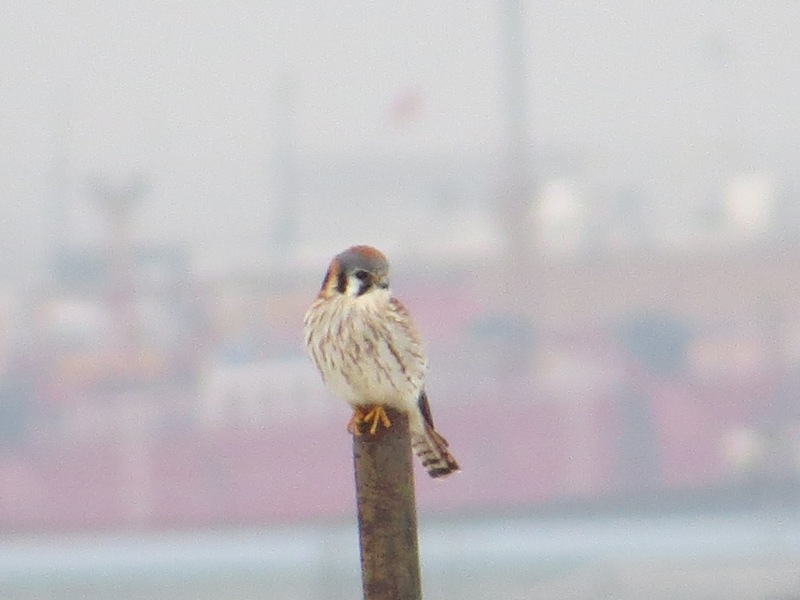 For most of my life, the falcons were found along with the other diurnal raptors in the bird guides. At least those bird guides which are organized by bird families, a strategy many beginning bird-watchers find confusing, but which starts making sense the deeper they go into the field. All the diurnal raptors were classed in the Falconiformes order. 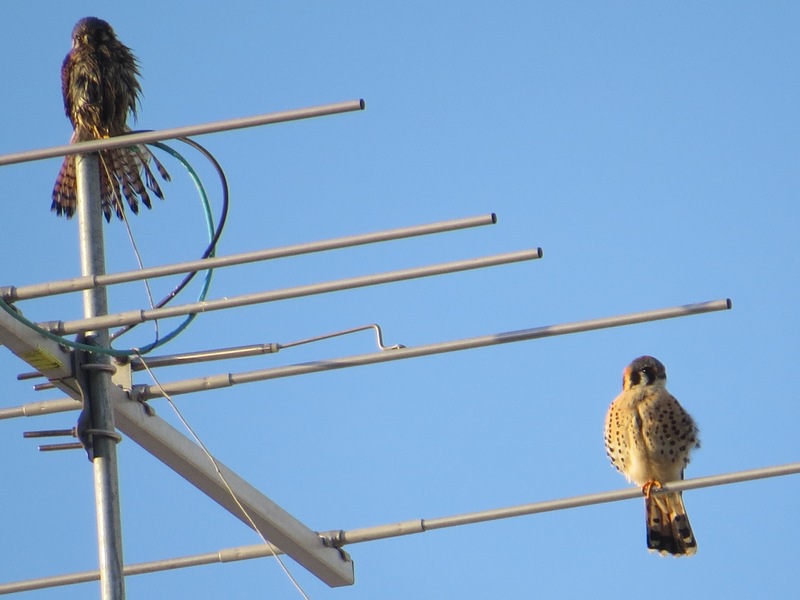 But then, about a decade ago, a study of bird genomes found that the falcons are not, in fact, closely related to hawks. They are actually closely related to parrots and passerines (songbirds). The other diurnal birds of prey (eagles, hawks, vultures) are now considered part of the Accipitriformes order. 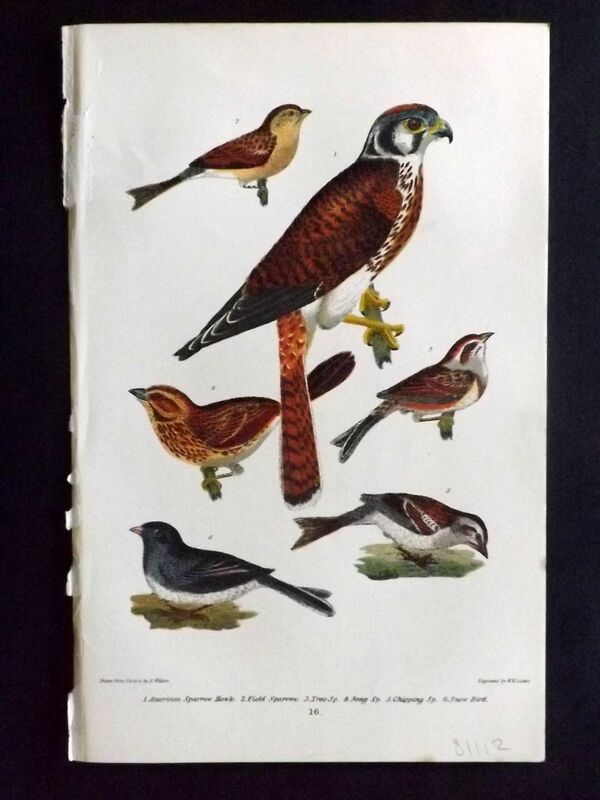 Which makes Alexander Wilson’s American Sparrow Hawk (an old name for the American Kestrel) and sparrow species juxtaposition, in Volume 1 of his American Ornithology of 1832, most interesting. He was perhaps going for a kind of (reverse) sympathy of like to like-to-eat. A pair on 4th Avenue, from last week. 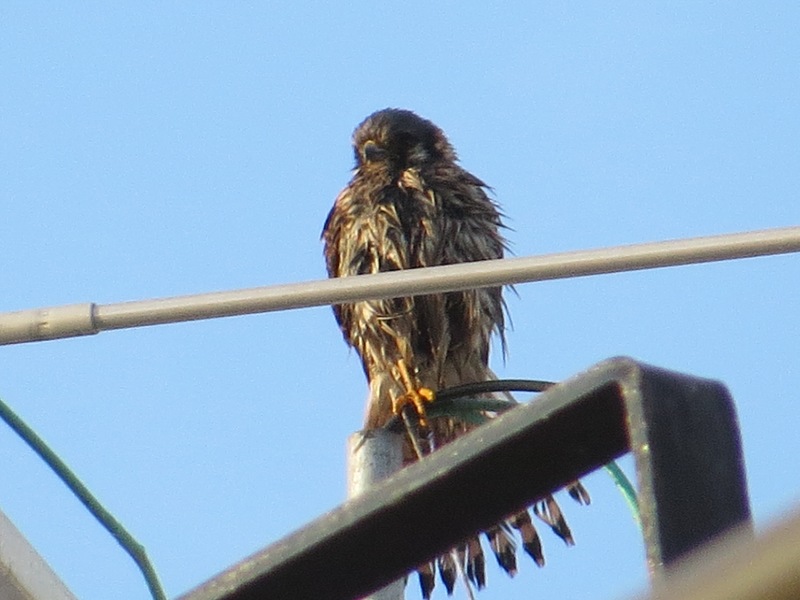 The female, on the upper left, is soaked to the feathers. I presume she has just bathed, hence also the fanned tail. Birds bathe most every day if they can, good for feather maintenance and cleaning, fighting mites, etc. Raptors, of course, can also be bloody. This was about an hour before sunset, which seemed late in the day to be wet.